Banana leaves are widely used for cooking and serving food in Asia, Africa and South America. Before the joys of modern refrigeration were discovered, people in tropical countries used to cook and wrap food in banana leaves to prevent them from spoiling. 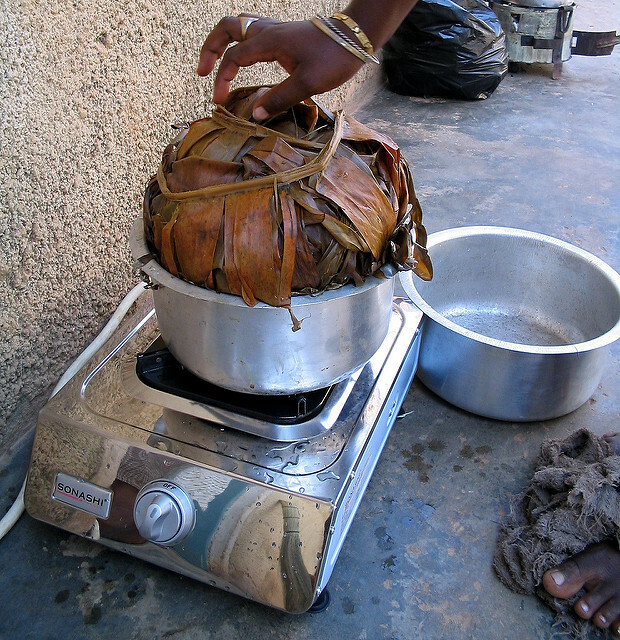 There is a reason for steaming, boiling, frying, baking or grilling foods in banana leaves as well. The leaf wrap protects food from getting burnt on an open flame. Wraps also hold the heat inside and cook food in their juices. These fresh, green leaves lend an aromatic and sweetish flavour to the final dish. Banana leaf is not the only “natural plate” out there – many cultures across the globe use a variety of leaves from bamboo, grape and lotus to corn husks and perilla to cook, wrap or serve food. 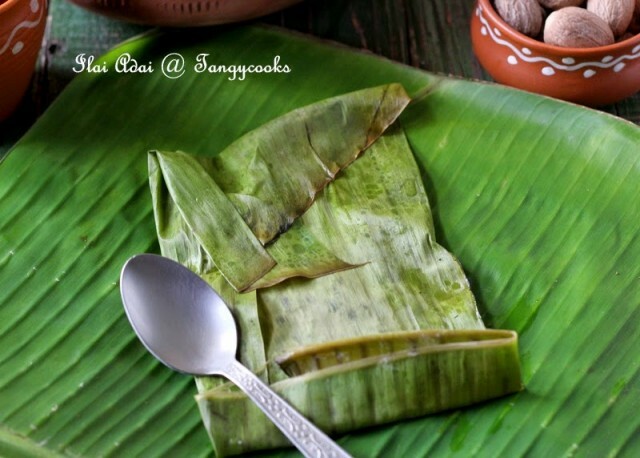 But there is something about banana leaves that makes them stand out – and it is not just their culinary properties. The plant is reach in natural antioxidants, which are also found in green tea – even though you cant eat the leaf, the antioxidants get absorbed into food during cooking. In some cultures banana leaves hold a prominent place as a ceremonial item. Hindus make food offering to deities on these non-edible leaves. South India retains its age-old custom of serving festive and wedding meals on them. Traditional foods in Singapore, Malaysia, Thailand and Indonesia are usually served on banana leaves or plates lined with them. 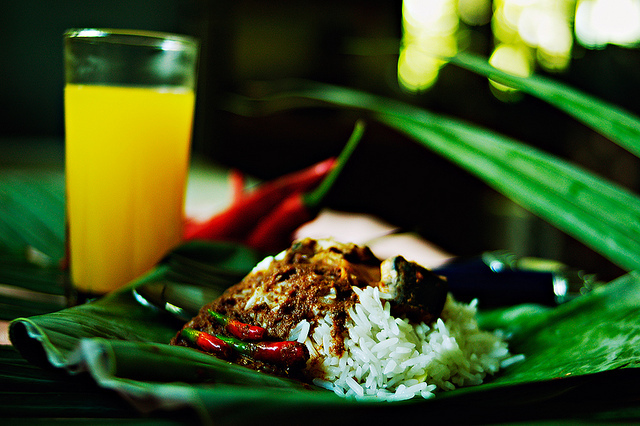 Some cooked foods are enclosed in banana leaves just before they are served. Indonesians turn these waterproof leaves into cone-shaped pinchuk to hold snacks, sticky rice dishes and satay. In Puerto Rico, arepas and sweet cassava tortillas are kept on banana leaf for some time before cooking. These steamed desserts and savouries are popular in Malay, Singaporean and Indonesian cuisines. 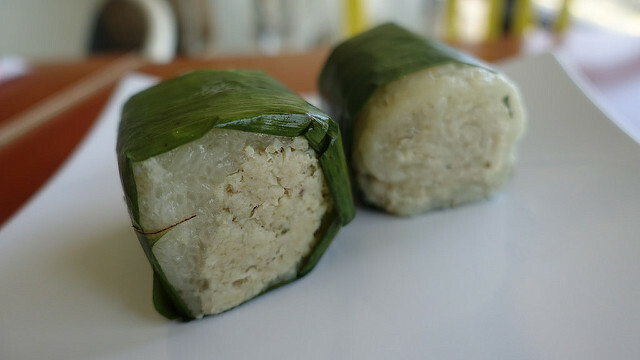 Some kuih versions are steamed or grilled in banana leaf wrapping. They contain rice flour or glutinous rice, gula melaka (palm sugar) and shredded coconut. Some steamed kway use pandan leaf extract, tapioca flour and mung bean powder. Kuih Kochi is a pyramid-shaped sweet dumpling that comes wrapped in leaves. 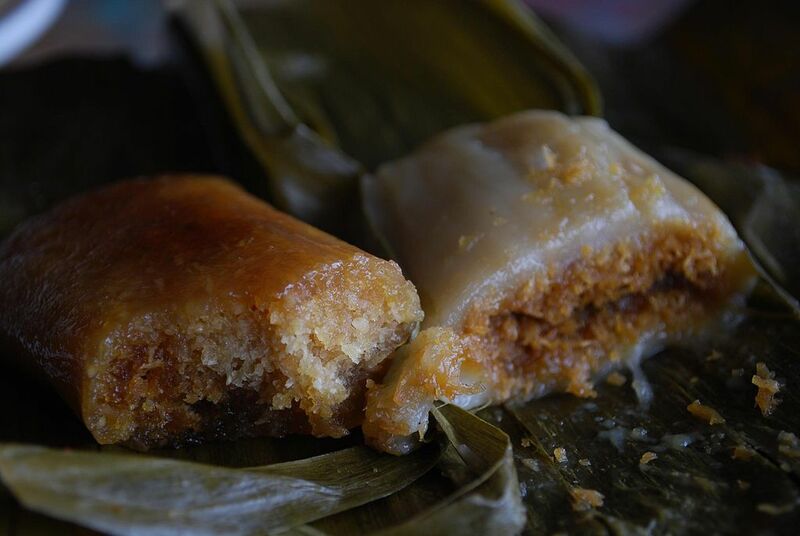 Kuih Bongkong is cylindrical sweet dumpling made with rice, palm sugar and tapioca and steamed inside banana leaves. In traditional recipes, fresh fish (spiced or marinated) is wrapped in banana leaf envelopes before it is grilled or steamed. 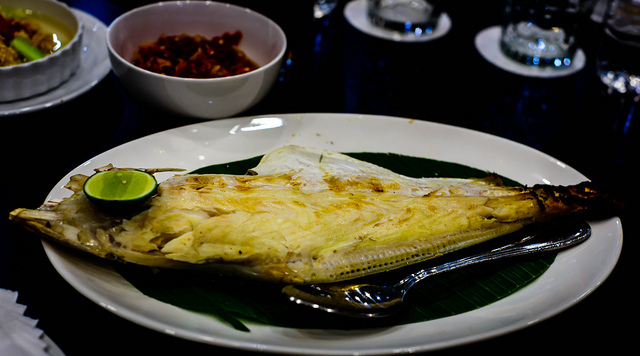 Ikan Bakar (burned fish) is a grilled dish where fish is marinated in spice paste and wrapped in leaf. In the Central African dish, Liboké de Poisson, fish is marinated in spices, enveloped in banana leaves and grilled or baked in an oven. Banana leaves are used for steaming Malay fish cake, Otak Otak. Machcha Patropoda (fish wrapped in banana leaf), is a dish from Bengal, India with marinated fish wrapped in banana leaves and steamed. In another Indian dish from Kerala – Karimeen Pollichathu (fish fry in banana leaves) – spiced fish is fried, enclosed in leaves, and further steamed for added flavour. Patrani Macchi (fish in leaves) is a popular festive and wedding dish among Indian Zoroastrians or Parsis. Flat fish or pomfret fish is coated with turmeric and salt, topped with green chutney, and steamed inside square leaf pockets. In South East Asia, different meat and egg mixtures are steamed in boats made with banana leaves. Aromatic spices and coconut milk add to the delicious taste of Cambodian Amok Fish. 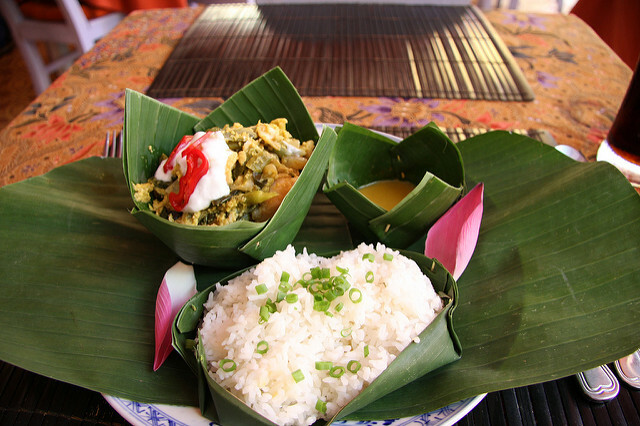 Savoury and sweet sticky rice dishes are steamed in banana leaves. 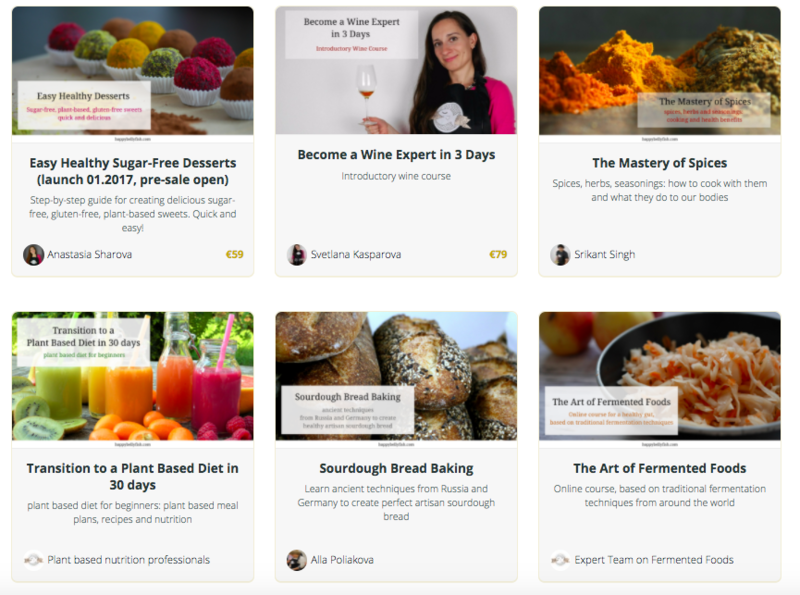 Popular recipes includes Khao Dome (Coconut Sticky Rice) from Thai cuisine and Indonesia‘s Lemper Ayam (Sticky Rice with Spiced Chicken). This steamed Latin American delicacy normally gets a corn husk wrapper. In Guatemala and Mexico’s Yucatan Peninsula and Oaxaca, spiced corn dough is filled with meat, vegetable, fruit or cheese stuffing and traditionally wrapped in banana leaves. 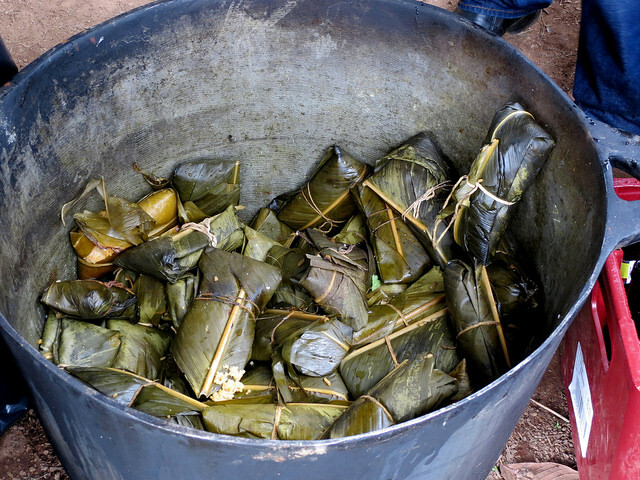 Banana leaves are used to wrap Nacatamal, a popular tamale dish in Nicaragua and Honduras. Corn meal tamales with meat stuffing are also cooked in banana leaves in Guam and Dominican Republic in the Caribbean. There is a similar dish in Puerto Rico as well. Their version contains green bananas, pork and roots like taro, cassava and yautía. 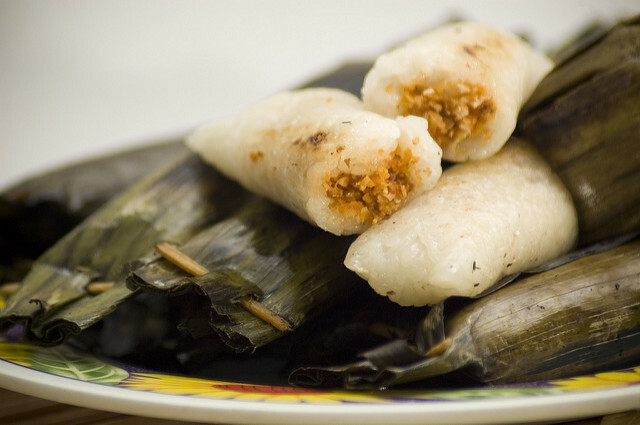 Guanimes are log shaped tamales made with yucan or plantain, and steamed in banana leaves. A famous Mexican dish, Cochinita Pibil, is prepared with marinated pork which is covered in double-layered banana leaf pouch, and roasted on an open flame. Barbacoa Tacos (lamb, pork or beef with tortillas) are alsos teamed in banana leaves and often served in them. 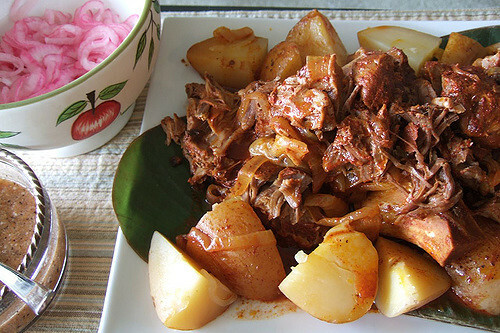 Vigorón, a traditional Nicaraguan dish, consists of boiled yuca, fried pork, and cabbage salad with veggies cooked in banana leaves. Costa Rica has its own banana leaf wrapped version of Vigorón. 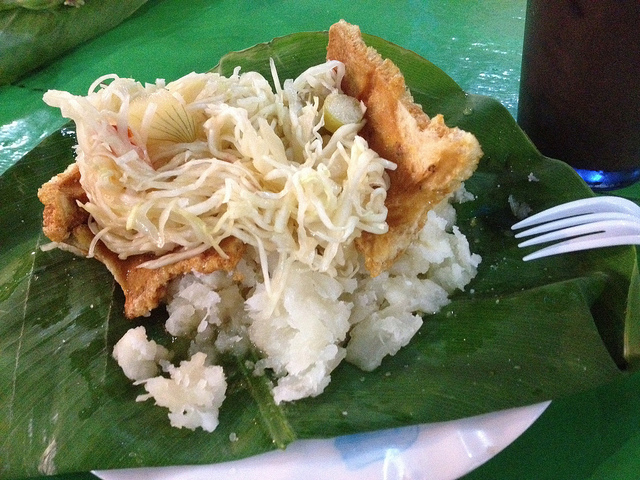 Vaho (Baho) is another Nicaraguan dish cooked in banana leaves and contains meat, yuca and green plantain. In Uganda, Tanzania and Rwanda, Matoke (type of green banana) is steamed plain or with other ingredients inside banana leaves. 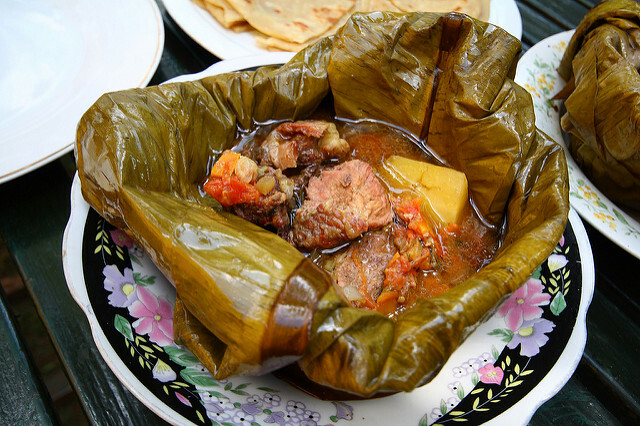 During the preparation of Luwombo stew roasted goat meat, chicken or beef are enclosed in banana leaves (Luwombo) along with stewed vegetables and spices and steamed in a basket. 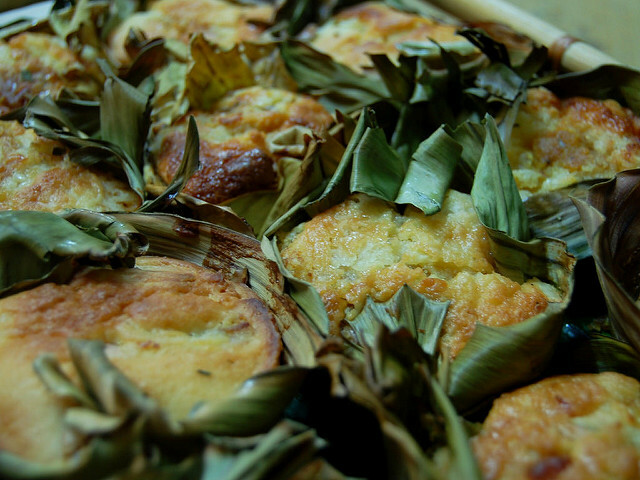 Bibingka is a coconut cake that is baked in pots lined with banana leaf, while Cassava Suman, a cylindrical cassava flour cake is steamed inside the leaves. 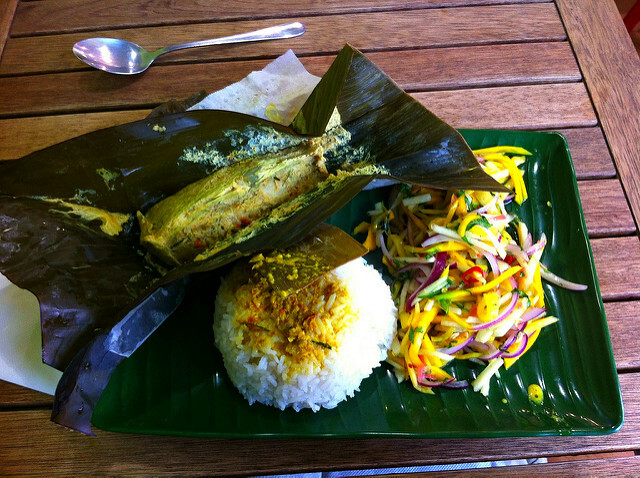 Pulut Panggang is a spiced rice parcel wrapped in banana leaf and grilled on charcoal. Pulut Itni is a leaf-wrapped sweet version shaped into pyramids. 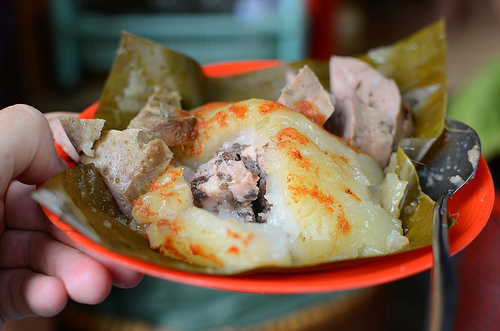 Spiced pork roll, Cha–Lua is wrapped in banana leaves and boiled. Banh Gio, a pyramid-shaped pork dumpling with mushroom and beans is steamed inside these waterproof leaves. In South India, savoury rice and black lentil dumplings like idlis and kadubu are sometimes steamed inside banana leaves. Vazha Elai Kozhukattai (banana leaf dumpling) is a steamed rice cake made with raw rice flour, shredded coconut and jaggery (cane sugar). Another sweet dish is Ella Adai (pancake in leaf) from Kerala. Rice flour is mixed with jaggery or jackfruit pulp and grated coconut and steamed inside banana leaves. Have you tasted any traditional or native dish wrapped and cooked in leaves? Do you have a favourite dish from your travels abroad? Let us know in the comments.